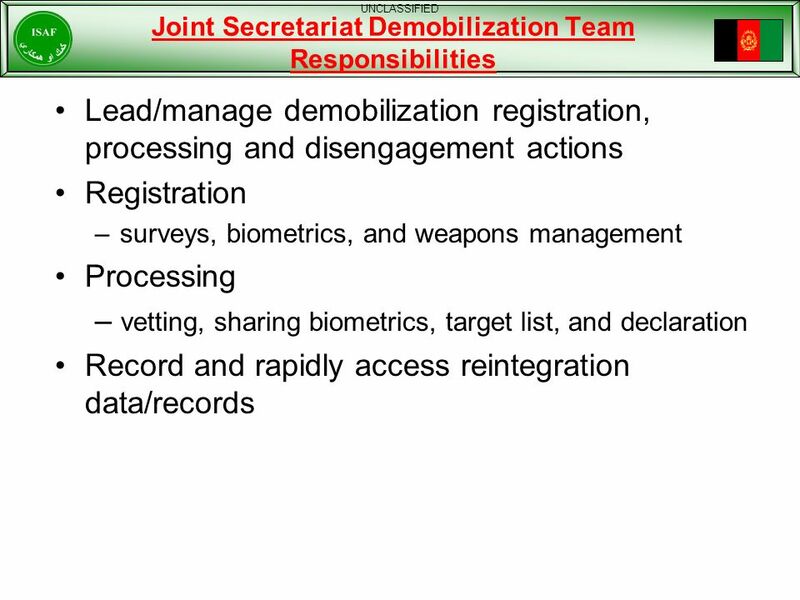 15 UNCLASSIFIED Demobilization Registration : PJSTs will arrange for registration to be conducted. 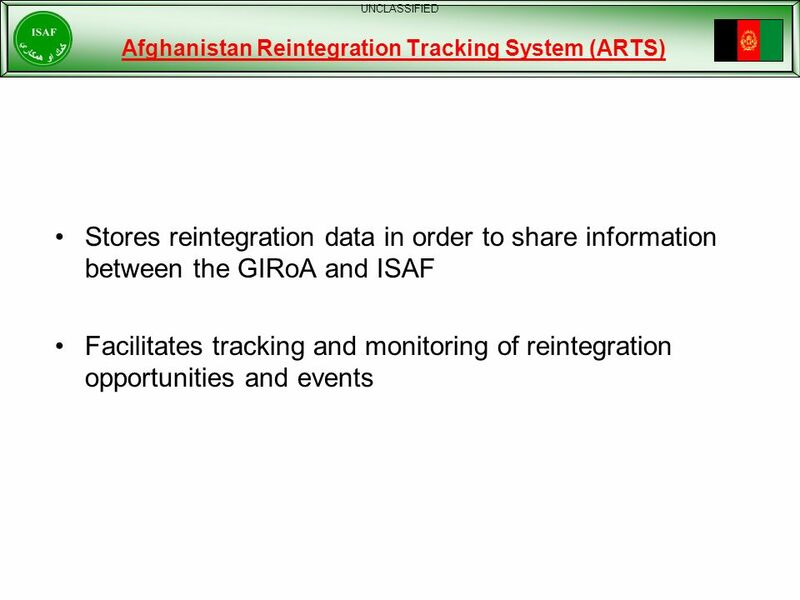 This includes completing the “Intent to Reintegrate” form and “Individual Survey”. 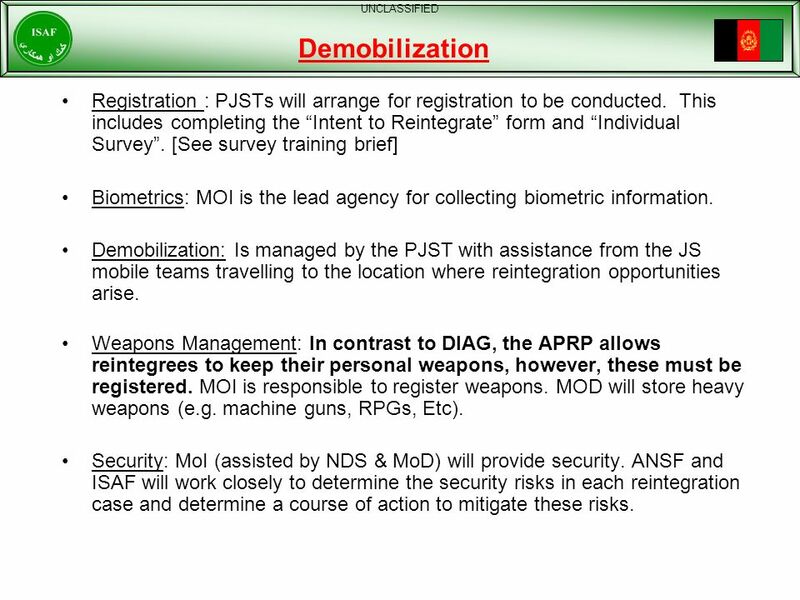 [See survey training brief] Biometrics: MOI is the lead agency for collecting biometric information. 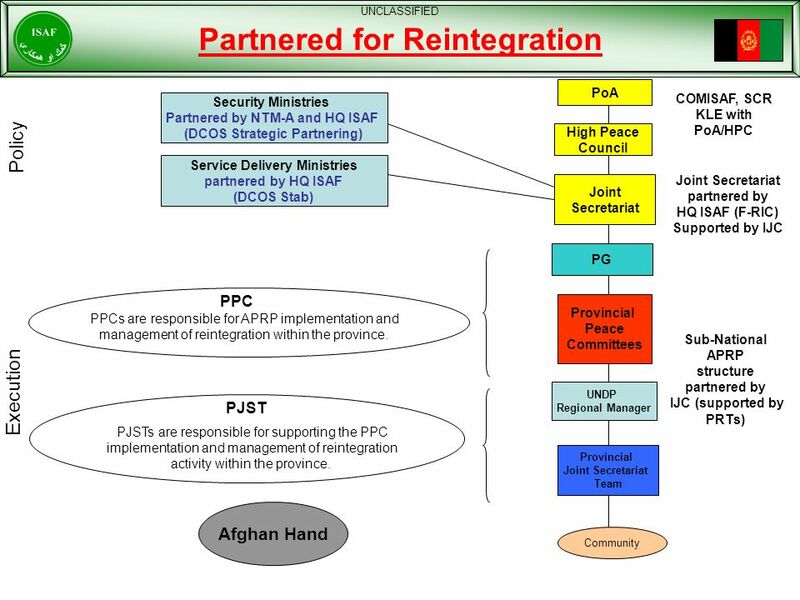 Demobilization: Is managed by the PJST with assistance from the JS mobile teams travelling to the location where reintegration opportunities arise. Weapons Management: In contrast to DIAG, the APRP allows reintegrees to keep their personal weapons, however, these must be registered. MOI is responsible to register weapons. MOD will store heavy weapons (e.g. machine guns, RPGs, Etc). 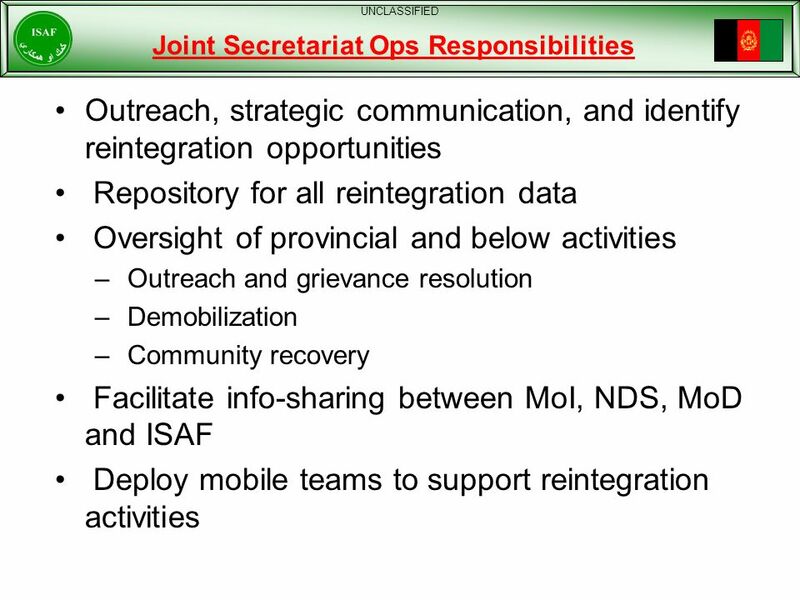 Security: MoI (assisted by NDS & MoD) will provide security. 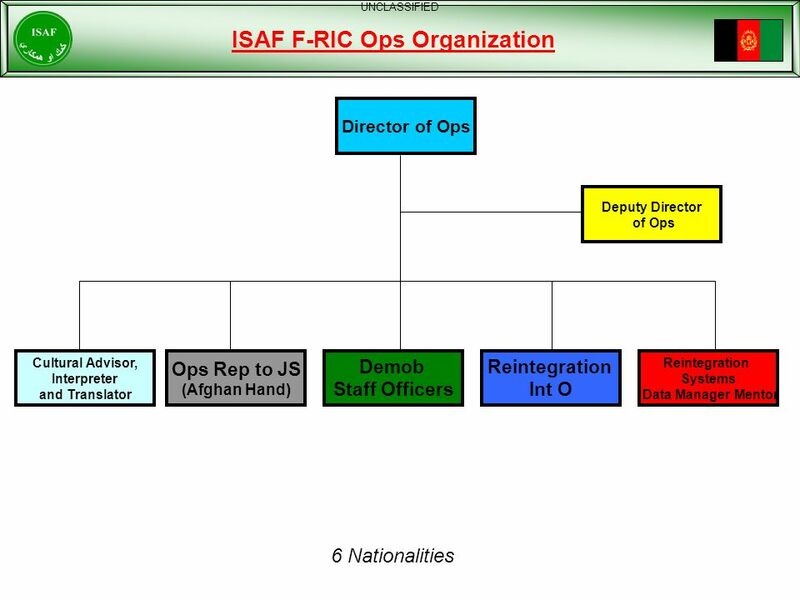 ANSF and ISAF will work closely to determine the security risks in each reintegration case and determine a course of action to mitigate these risks. 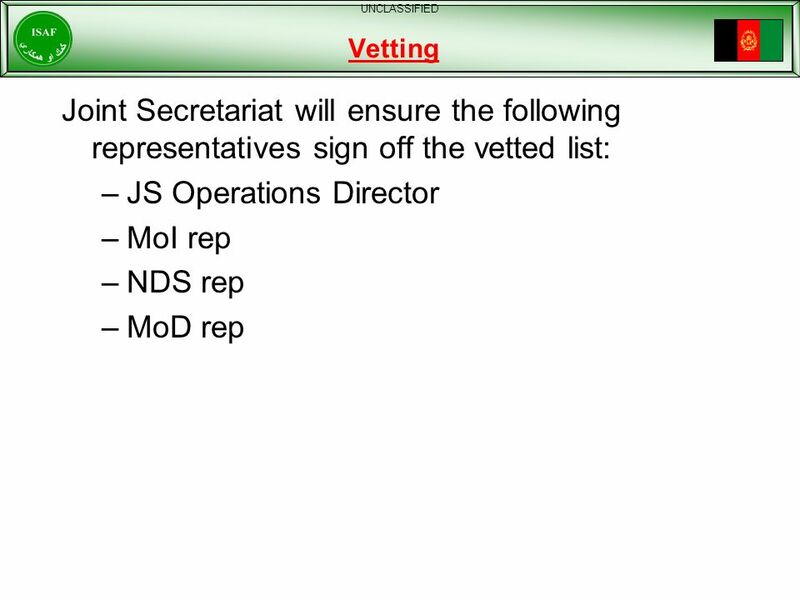 UNCLASSIFIED Vetting Provincial Governors (PG) and their staffs (i.e. 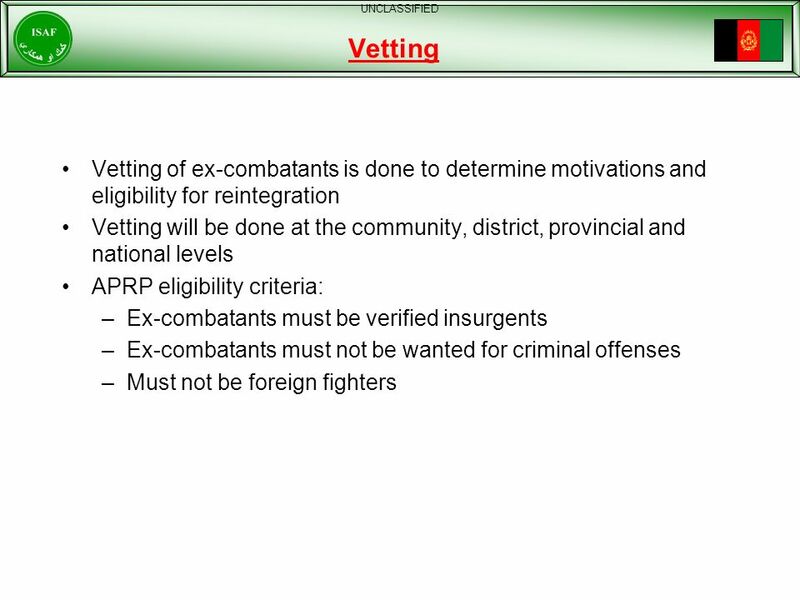 PJST) will: Confirm in writing that ex-combatants are eligible based on community and provincial vetting. 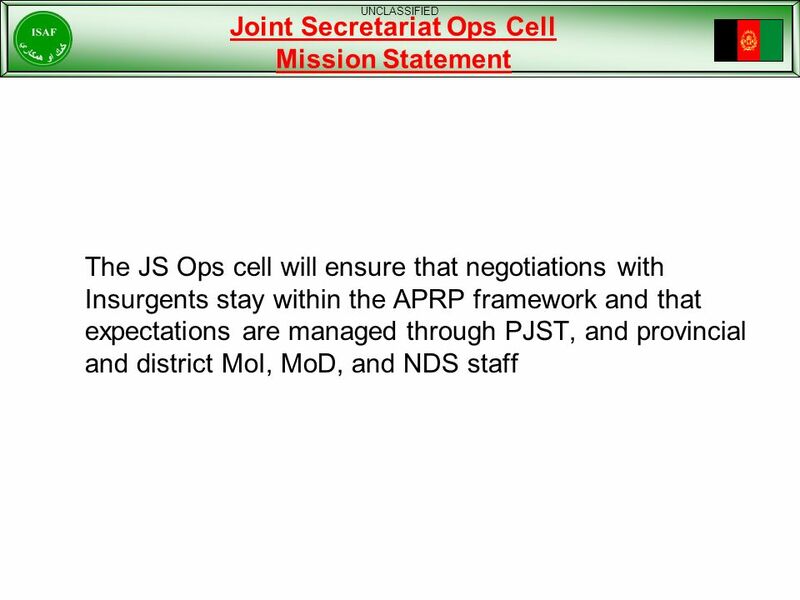 Send vetted list of ex-combatants to the JS. The list will be signed by the PG and counter-signed by the Chairman of the PPC, CoP, NDS Chief and ANA Provincial Security Shura representative. This signed list will verify that those individuals are eligible for the peace program. 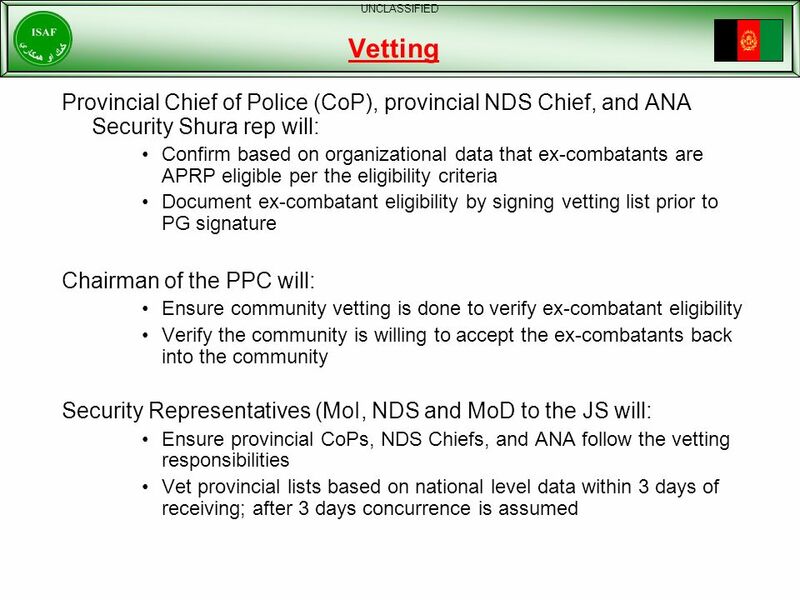 Oversee the conduct of community vetting Shura to ensure fairness. 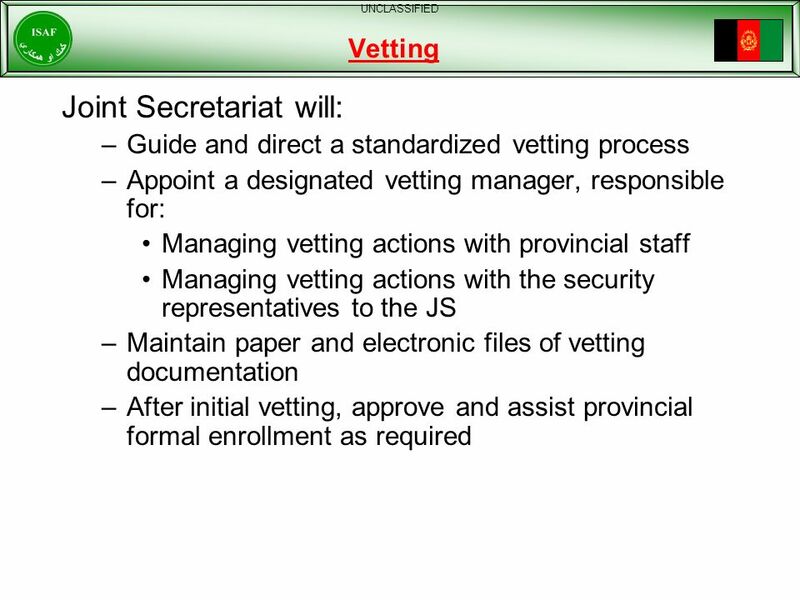 Keep paper and electronic files of provincial vetting documentation in the PJST. 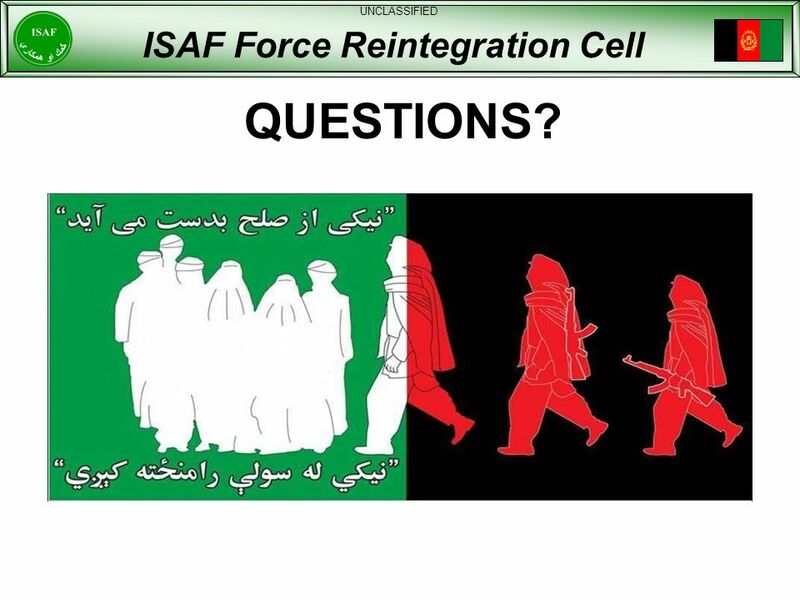 UNCLASSIFIED ISAF Force Reintegration Cell QUESTIONS? 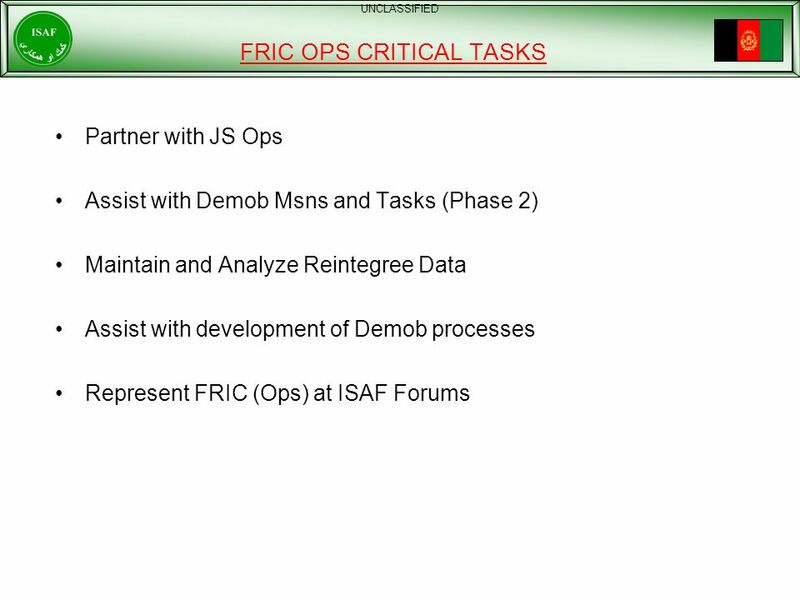 Download ppt "F-RIC OPERATIONS OVERVIEW"
Core Business of UN Police and its Key Partners By Inger & Catheline. 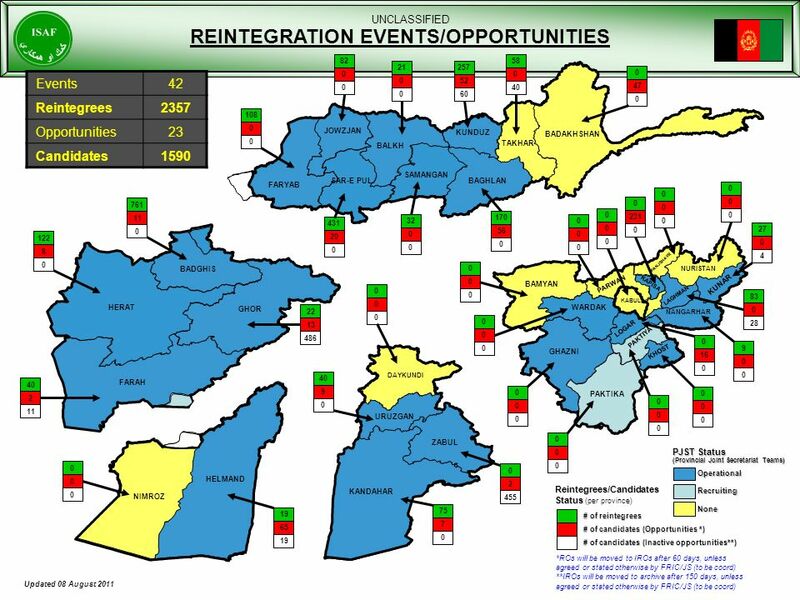 1 Linking Provincial Priorities with National Programs: 1391 Provincial Budget Unit Ministry of Finance Government of Afghanistan Islamic Republic of Afghanistan. Islamic Republic of Afghanistan Independent Directorate of Local Governance Evaluation of Human Resources in the Provinces and Districts Presentation July. 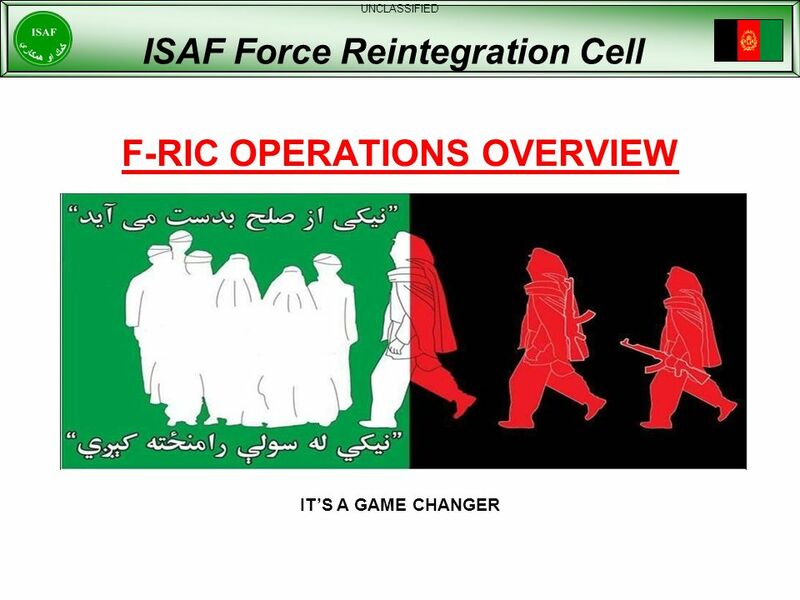 Afghanistan Peace and Reintegration Program (APRP) Religious and Cultural Affairs (RCA) Officers and Mullahs APRP Awareness Brief Unclassified This. 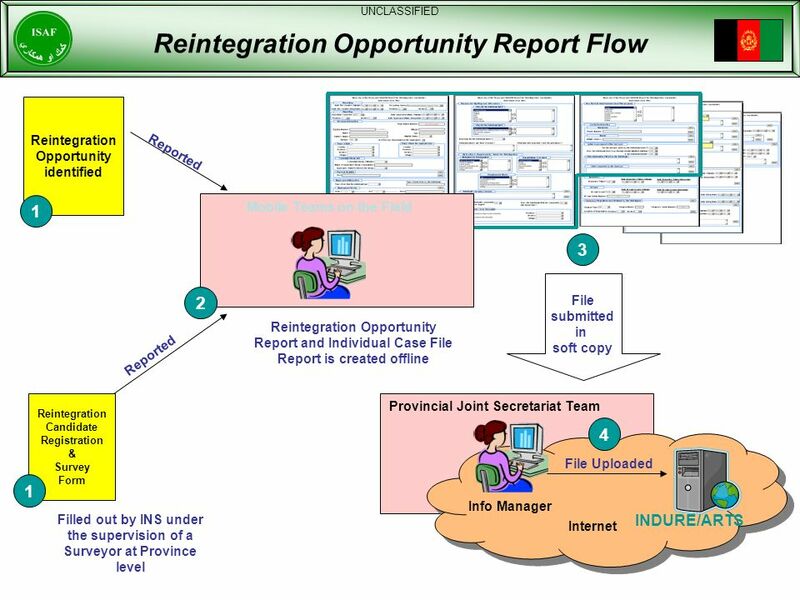 Instructions for Filling out the Intent to Reintegrate Form Survey Training. 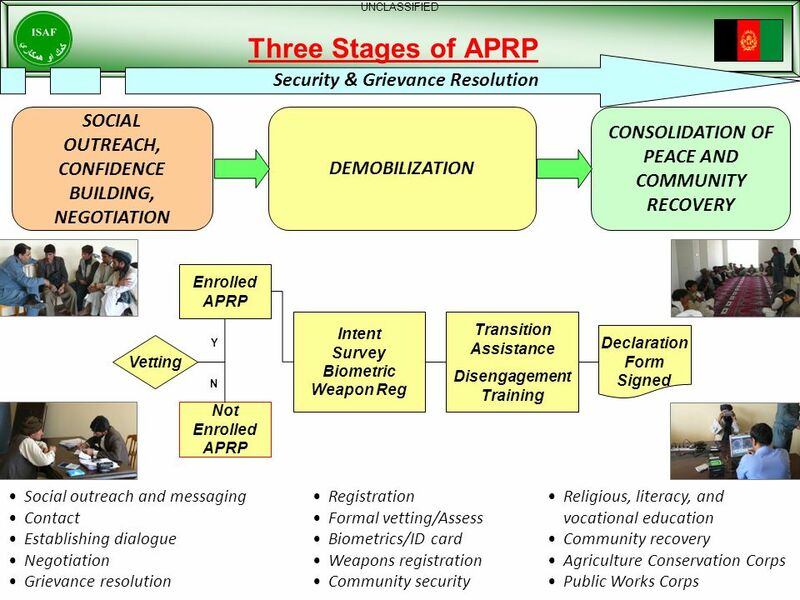 Afghanistan Peace and Reintegration Program (APRP) ANA and ANP Officer APRP Awareness Brief Unclassified (ANSF Officers APRP Awareness Brief Version 2. 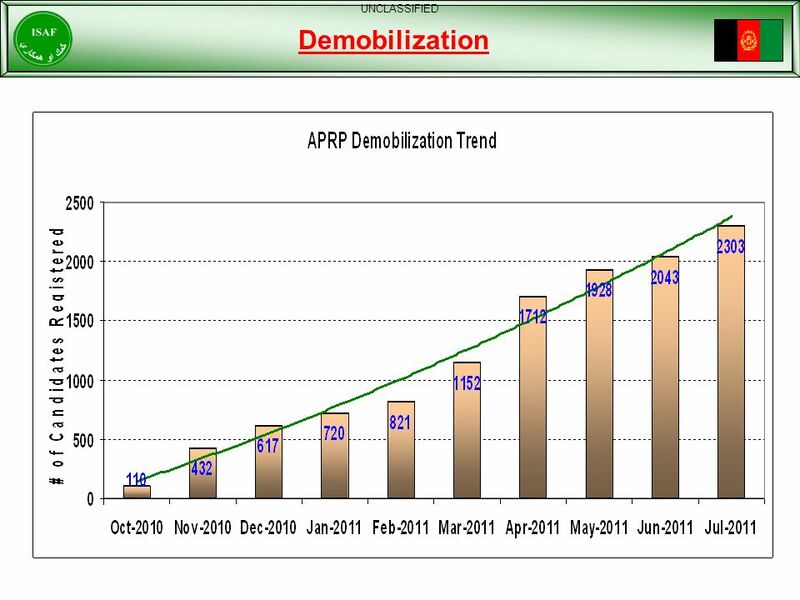 RC-N CERP PROJECTs REPORTED IN CIDNE IN THE LAST 12 MONTHS From 31 July 2009 To 01 August 2010. 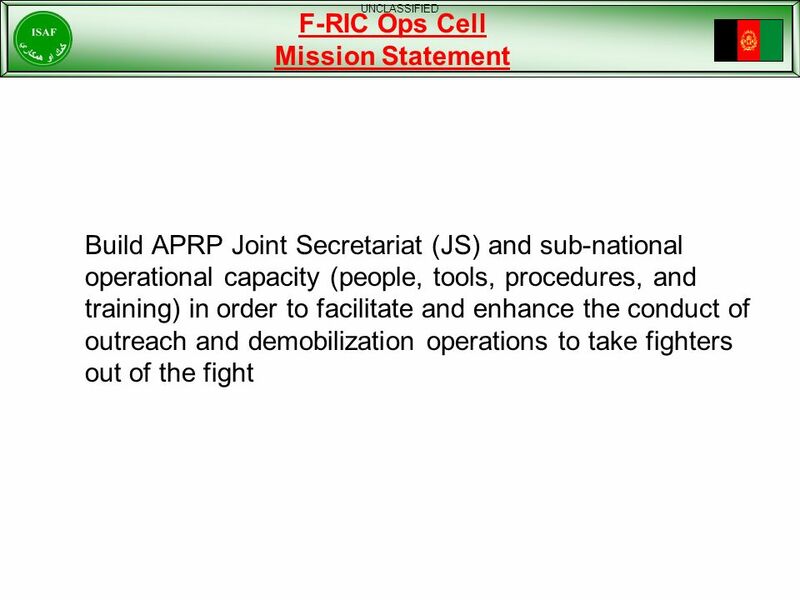 This Briefing is UNCLASSIFIED ISAF COIN Advisory & Assistance Team (CAAT) 29 October 09 “We need to think and act very differently to be successful.” GEN.